There are generally no risks. Because this procedure merely monitors the electrical impulses and does not emit electricity, there is no risk of shock. 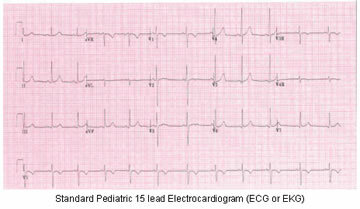 During an exercise electrocardiogram, some patients experience arrhythmias or heart distress. Equipment for dealing with these occurrences is located in the testing area. The accuracy of the ECG varies with the condition being tested. Some heart conditions are not detectable all the time, and others may never produce any specific ECG changes. A person who suspects heart disease or has had a heart attack may need more than one ECG. There is no reason for healthy people to undergo annual testing unless they have inherited risks or a medical condition. It is important to be relaxed and relatively warm during ECG recording. Any movement, including muscle tremors such as shivering, can alter the tracing.